There are no generic Indian dishes on the menu here, thanks to the freedom given to chefs Floyd Cardoz (formerly of Danny Meyer’s Tabla in New York) and Thomas Zacharias. Highlights include moringa (drumstick vegetable) soup, fish roasted Kerala-style in banana leaves, and black sesame duck from the northeast. Reservations recommended. At this stylish south Bombay café, start your day with with Parsi-style akuri — scrambled eggs with tomato and coriander — and iced coffee, or a shot of organic wheatgrass. The coffee beans are sourced from Indian estates in the south; buy a bag to gift. Mumbai is a few hundred kilometres down the coast from the state of Gujarat, home to one of India’s great regional cuisines. But you can find a bright, modern twist on Gujarati fare in this small, always-packed eatery. The multigrain pancake, thalipeeth, is among the most popular choices. For decades, the city’s glitterati have descended upon this see-and-be-seen lounge for afternoon high tea. The finger foods range from classic scones with strawberry jam to kheema ghotala toasties, while the fine Darjeeling teas include the hard-to-find Castleton Second Flush. At sunset, all of Mumbai is bathed in golden-red light, and the best place to take it all in is the rooftop bar of the Four Seasons, with a Negroni in hand. From the 33rd floor, you have a bird’s-eye view of many historic neighbourhoods, including the old mill areas, as well as a million people heading home at rush hour. 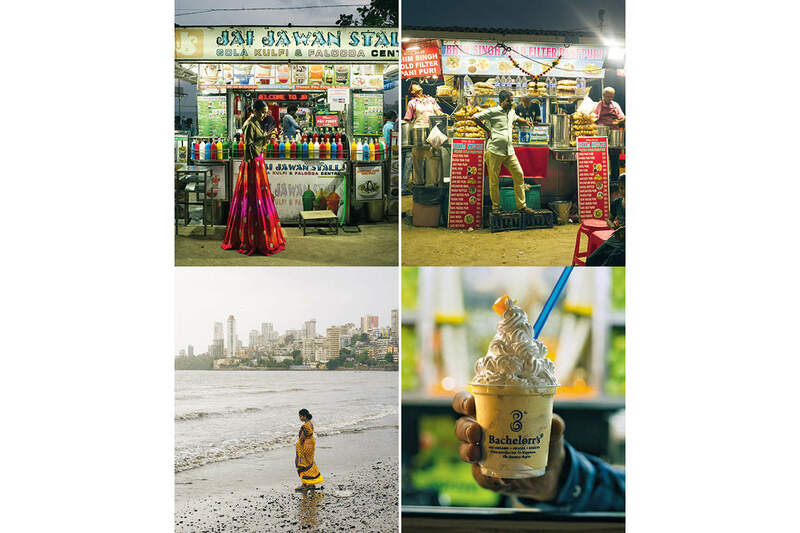 By Indian standards, Mumbai is a relatively young city — less than 400 years old. But a picturesque 10-km ferry ride east into the bay takes you 1,500 years back into time. Here, at the ethereal (and a little eerie) Elephanta Caves, a UNESCO World Heritage Site, the great gods of Hinduism are cast in giant relief. Recently reopened to the public after being shut up for three decades, this plush historic venue now hosts concerts, plays and book launches in its spectacular red and gold auditorium. After the show, head to the courtyard café for wood-fired pizza, or walk five minutes to Chowpatty Beach for ice cream. Founded in 1872 as the Bombay outpost of the Victoria and Albert Museum, this long-derelict building has undergone an exhaustive restoration over the past decade. Of particular interest is the collection of 19th-century maps and photographs showing how Mumbai transformed from a swampy set of islands into a jewel of the British Empire. This tiny, atmospheric playhouse in the suburbs is arguably India’s most beloved theatre — especially by actors, who appreciate the closeness of the audience. Prithvi hosts more than 500 shows a year, including old and new plays in the languages of Mumbai: English, Hindi, Marathi and Gujarati. You’ll also find an excellent bookshop, and an open-air café that buzzes at night. You don’t know a country until you find out what makes it laugh. Perhaps surprisingly, stand-up comedy is an increasingly popular trend in Mumbai. It’s proof of a confident new India that can take a roast (and do it in English, with multiple accents and registers). At Radhi Parekh’s gallery shop, you can find handmade crafts and textiles by regional Indian artisans. But even more fascinating are the lectures and exhibitions regularly held here: One recent showcase spotlighted the distinctively embroidered quilting from Katna’s Kantha, a Street Survivors India project in Murshidabad that employs 1,500 women in 50 villages. The late Canadian singer Laura Hamilton, a legend in Mumbai’s art scene, arrived during World War II and never left. Studio Malabar, in the tony Malabar Hill neighbourhood, is a successor to her tasteful boutique at the Taj Palace, Malabar. Cushion covers in lush jamawar silk, Mughal-era-style hookah vases, and antique enamel milk cans compete for your eye across 2,000 square feet of Indian arts and artifacts. This Indian brand proves the secret of stylish Indian dressing is not just fine fabrics but also skillful tailoring. Founder Akshay Narvekar offers the best cotton, linen and denim, and dozens of options for cuts, cuffs and collars to make a shirt that’s yours alone. At this specialty shop, tea sommeliers offer complimentary tastings. They’ll take you through the nuances of more than 65 varieties of white, green, oolong, black and flavoured teas from India, including single-estates from Darjeeling and Assam. With this Jaipur-based fashion label, India’s well-respected textile tradition meets contemporary styling. The label’s vivid block-print dresses and tunics, a testament to the skills of the company’s 800-plus artisans, are perfect for humid Mumbai nights. Since 1903, the Taj has played host to royalty, statesmen, matinee idols and rock stars. (Canadian Prime Minister Justin Trudeau has reportedly stayed there.) From the views of the Gateway of India and the yacht-filled harbour to the Indian art on display, there’s a sense of grandeur. Ask for the Heritage Walk with a butler before you hit your king-size bed. Located in the heart of the commercial district, this glamorous, recently launched skyscraper hotel offers complimentary butler service with every room (they’ll even iron two clothing items for you each day). Sip a betel-leaf-flavoured paan martini at the colonial-style Kipling Bar before retiring to your suite for panoramic views of the Arabian Sea. Handmade art-deco tile flooring and carefully restored vintage furniture deck out Mumbai’s favourite boutique hotel. Rooms come in a range of sizes and rates, and breakfast in the small, bustling lounge is a great place to make new friends. The property also offers Mumbai tours with English-speaking guides, including a day trip to the fishing village of Alibag. Located at one end of Marine Drive — India’s most famous seaside promenade, also known as “The Queen’s Necklace” — this 35-storey hotel offers brightly appointed rooms with a view. Start the day with a masala omelette, espresso and people-watching in its spacious lounge, the Verandah, and end the evening by the swimming pool, the place to be at sunset. At this colourful, 16-room art hotel, you’ll be introduced to work by some of the country’s best young painters and sculptors. The suburban location will place you at a distance from the bustle, and any fatigue from your day’s rambles can be kneaded out with a Balinese massage at the highly rated Angdai spa. From Mumbai’s Chhatrapati Shivaji Airport, there are metered taxis, but these aren’t recommended. Instead, you’re better off booking a prepaid taxi authorized by the government as you exit the arrivals hall. Choose from two classes: air-conditioned or non-. The journey downtown costs about Rs.850 ($15) by cool cab. Uber cabs are also easily available at both terminals, as are the reliable private-cab operators EasyCab and Meru. Mumbai is well served by a bus and commuter train network, but both are excessively crowded and not recommended for getting around (unless you’re keen for the experience alone). Taxis are available throughout the city and especially in the south, where auto-rickshaws are prohibited. Expect a 50-percent taxi surcharge from midnight to 5 a.m. North from the suburb of Bandra, auto-rickshaws are the main mode of transport. The city has no special lanes for bicycles and cycling is not recommended, except in certain parts of south Mumbai. See the hidden side of the city, from midnight rotis to a dockside dawn. Mumbai: humid heat, teeming streets, challenging city planning and survival-of-the-fittest culture can make the day feel like war. But as evening falls and the air cools, Mumbai lets out a collective sigh – part relief, part anticipation. I’ve lived there most of my life, set my novels there, and for me, Mumbai after dark is a bouquet of sensual pleasures. Here, from sunset to sunrise, is my itinerary for the perfect Mumbai night. It’s a sweaty evening in south Mumbai. I jump out of the commuter train at Churchgate Terminus while it’s still moving, not because I’m in a hurry but to avoid being knocked over by hordes of invading commuters heading home. From here, though, it’s all peace and pleasure on the walk down Marine Drive to the city’s most storied beach. My stomach starts calling for the second part of that song: bhelpuri. Moments later I’m biting into Mumbai’s signature snack from a nearby stall, a colourful toss-up of puffed rice, chopped onion, chilli and potato, tart with tamarind sauce and crunchy with crispy bits of fried chickpea flour calledsev, all wrapped in a cone of newspaper (which some people even read when they’re finished eating). Half of my bite spills out of the paper; the mess is part of the fun. For dessert, Bachelorr’s: First set up in the 1930s, this tiny, unpretentious joint has no seating but always dozens of customers, all trying to catch the attention of the harried waiters for milkshakes and ice cream. When I succeed in catching one’s eye, I shout my order – Mumbai waits for no one. Today, the creamy splendour of custard-apple ice cream is in season; my second favourite is green chilli ice cream (always in season). The bell rings and in the dark I hear the patter of feet shuffling through the door just before it shuts. Then the lights come on, washing over a small semicircular stage below me. A couple hundred people draw in their breath. For the next two hours, this intimate space will be our world. No matter how famous or rich, every Mumbai actor, including the big stars of Bollywood, secretly dreams of taking a bow in this venue (capacity 180, closed Mondays). Established in 1978 close to Juhu Beach in the western suburbs in memory of the great Mumbai actor Prithviraj Kapoor, Prithvi (“the world”) Theatre is so small that those in the front row could easily whisper compliments or reproaches into the ears of the lead actors. (Some do – some even get replies.) Going to Prithvi is a rite of passage. I was taken there by my father for the first time at age 15 to see a production of Waiting for Godot, and there hasn’t been a week since that I haven’t scanned the newspapers for what’s playing – the theatre hosts over 600 shows a year. Tonight, I watch a production of George Bernard Shaw’s Dear Liar starring Mumbai’s most famous theatre couple, actors Naseeruddin Shah and Ratna Pathak Shah. They’re veterans, as are many in the audience. Waves of pleasure ripple back and forth between stage and crowd. Those who love Prithvi make a whole evening of it. Outside the theatre are a small bookshop and an open-air café where I order an Irish coffee. The café is also famous for its “cutting chai”: the Indian brew of tea leaves, milk and cardamom, called “cutting” because it’s customarily served by the half-glass and thus “cut” into two. (It’s not just the people who are willful in Mumbai, but also the verbs.) Young actors and industry hopefuls, still hot from the performance, mix with renowned directors and playwrights chattering about their latest productions. Despite the late hour, the clamour of traffic, radios and voices drowns out my own thoughts. I’m on Mohammed Ali Road, where it was unanimously decided many decades ago that silence belonged in the Himalayas. Here, in a city of many different religions and cultures, lies the heart of Islamic – and carnivore – Mumbai. I make my way half-involuntarily, bumped along by the crowd, over the narrow sidewalks glutted with vendors selling everything from lingerie to handbags to religious literature to the cloying perfume – a hundred roses distilled into a drop – known as attar. Many of the women wear burkas (even those driving scooters), and an array of tasty meats are fried, grilled or roasted right on the pavement, from the familiar pleasures of tandoori chicken to the are-you-up-for-it challenge of goat testicles. “Hello, sir! Don’t see you very much around here these days. Gotten bored of our biryani?” shouts Abdullah, one of the waiters at Noor Mohammadi, a small restaurant that every meat-eating Mumbaikar has been to. We’ve known each other ever since he first came to work here as a teenager, and adulthood has not erased Abdullah’s impish smile (though it has added a moustache to it). I’m lucky tonight – I have a table to myself. But on weekend nights or during Ramadan, I’ve found myself sharing with a family of four or breaking naan with a cabal of taxi drivers. Tonight I feast on hot, yeasty tandoori rotis, brought out of the kitchen in stacks and distributed to whoever raises a hand. I break off a piece of the flatbread to scoop up yellow dal topped with a glistening splash of ghee, then wrap it around a morsel of juicy beef kebab, raw onion and a fiery green mint chutney. As I eat, I try to file away my memories of the most interesting and beautiful faces that met my gaze in the past hour – there were at least five thousand. It’s past midnight and like any good Mumbaikar, I still can’t stop hurrying. That’s because I don’t want to miss the last northbound train to Borivali from Churchgate Terminus. The train is nearly empty, but as it rumbles northward – covering 40 kilometres and 20 stations in 70 minutes – it will fill up. At this hour, Mumbai’s frenetic energy fades into exhaustion. The best place to experience the enormous, soul-shaking fatigue of a Mumbai night is on the last train home, mixing with street vendors after a long day’s labour, tired executives, jobless stragglers, querulous alcoholics – even the odd colourfully dressed group returning from a wedding. Many people sit, but a remarkable number choose to stand by the open doors, jostling for first place at the very edge, heels inside the compartment, toes and heads outside, keeping close watch on each other all the time. That’s Mumbai for you: It even does solitude and introspection as a crowd. The train chugs past the arrogant new skyscrapers of central Mumbai rising above tired teeming tenements. I start by the door but am soon pushed back into third place by two masters of the edge. Not far from my feet, two teenaged boys sit shoulder to shoulder on the floor, sharing a pair of earphones as they listen to Hindi film songs on a mobile phone. Soon they’re asleep, leaning their heads against each other. For millions in this hyperactive city, sleep is a fitful, fragile thing, never fully possessed but caught on the fly. Soon, at the last station, it will be time to wake up again. In my cab to Ferry Wharf in the humble neighbourhood of Mazgaon on the city’s eastern seafront, I see the long passageway to the pier is already populated by dozens of people. They are big or small fish in the port city’s vast marine economy: restaurateurs, tea sellers, brightly dressed women from the city’s traditional fishing community, the Kolis – even wiry kids whose sprightly fingers peel, scale and devein fish faster than you can say Ferry Wharf. Like fireflies, small yellow lights glimmer in the distance: the fishing trawlers coming in after a night at sea. And then, suddenly, bedlam. The trawlers dock and their workers expertly toss huge baskets of fish – mackerel, crabs, pomfret and the floppy little fish called Bombay duck – up onto the pier. These are sold wholesale or, in the case of especially big or valuable fish, even traded in short, sharp auctions, with dozens of people jockeying for the prize. In this city that so loves dhanda – trade, business – every person here is buying, selling, bargaining and using the night to get a head start on the long day to come. Above the cacophony, a streaky purple dawn appears like a watercolour painting. Night is over, but is it really? Sometimes I think that Mumbai lives one long, restless day, always weary, always awake. Always alive.